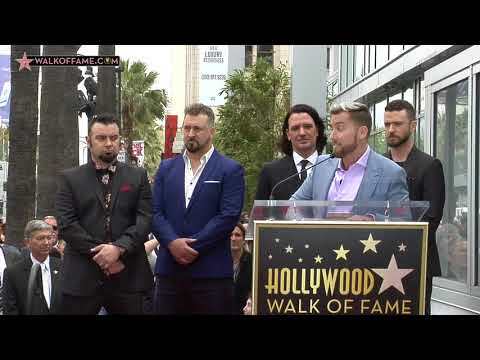 The Hollywood Chamber of Commerce proudly honored musical band *NSYNC with the 2,636th star on the Hollywood Walk of Fame today, April 30, 2018 at 11:30 a.m. PDT. The star was dedicated in the category of Recording at 7080 Hollywood Boulevard near the corner of LaBrea. They joined other boy bands at that location including: Backstreet Boys, Boyz II Men, New Kids On the Block, and New Edition. Helping Emcee Leron Gubler, President & CEO of the Hollywood Chamber of Commerce to unveil the star were celebrity speakers Ellen DeGeneres and Carson Daly. *NSYNC – Lance Bass, JC Chasez, Joey Fatone, Chris Kirkpatrick and Justin Timberlake have sold over nearly 30 million records in the U.S. and 42 million more worldwide. The group charted with a dozen singles, conquering Top 40, AC, Dance, Latin, Country and R&B charts. Their gargantuan worldwide “No Strings Attached” arena tour and “PopOdyssey” stadium tour rewrote sales, artistic and technical standards for road shows (when tickets for the first 52 “Strings” dates went on sale, tickets sold out in record times). Later, the stripped down “Celebrity” tour zeroed in on *NSYNC’s musical prowess. The group even refined the definition of a boy band, working with “grown-up” acts like Gloria Estefan, Celine Dion, Phil Collins and Richard Marx. *NSYNC’s first single “I Want You Back” snatched three long-held records: it hit the singles charts faster than any other new act (after one week) and had the longest Top 10 stay ever for a new group (eight weeks), while they became the fastest newcomer to hit the Top 10 (in three weeks) “I Want You Back” also hit No. 13 on the singles chart, sold a million copies and remained active at radio for half a year. From there, *NSYNC cruised onto the fast track, making history with most every move. Their self-titled debut album ultimately peaked at No. 2 and sold more than 10 million copies stateside; the group was named the No. 3 new act of 1998 by Billboard. Their third single, the ballad “(God Must Have Spent) A Little More Time on You” became *NSYNC’s first top 10 release and a No. 2 at AC radio, Fourth radio-friendly pop single, “I Drive Myself Crazy” followed. At the end of 1998, *NSYNC’s self-titled 18-month-old debut CD was the No. 4 disc of the year in 1999, while they were deemed the No. 2 pop album group/duo.As the new millennium dawned, the group contributed vocals to Gloria Estefan’s “Music of My Heart” which became *NSYNC’s biggest hit to date, peaking at No. 2 on the singles chart and at AC radio. The release of “No Strings Attached” in April 2000 marked a transition for the group, having inked a new deal with Jive Records the previous Fall. The CD debuted at No. 1 selling one million copies the first day, a record of 2.4 million copies the first week and spent eight consecutive weeks at the summit. The first single, the independence-themed “Bye Bye Bye,” not only resonated with listeners to the tune of No. 4 on the singles chart, but it was nominated for Song of the Year at the Grammy Awards. In an instant, the world’s most popular boy band graduated to the major leagues in terms of artistic achievement. Follow-up single, “It’s Gonna Be Me,” perhaps the group’s definitive dance refrain, at last catapulted *NSYNC to No. 1 on the Billboard Hot 100 in the summer of 2000. Third release, the love ballad “This I Promise You,” written and produced by Richard Marx, displayed an elegance and maturity that made the song a true classic in the group’s catalog and one of the year’s indelible melodies; it was also *NSYNC’s fourth consecutive top 10 hit and their first AC No. 1. The song was also recorded in Spanish as “Yo Te Voy A Amar,” which *NSYNC performed on the Latin Grammy Awards. “No Strings Attached” finished as the best-selling album of the year, while the group was the leading top 40 act and top pop artist/duo of 2000. The five-time platinum “Celebrity” spawned smashes, “Pop,” “Gone,” and “Girlfriend” featuring hip-hop namesake Nelly. Since going on hiatus in 2002, the guys have embarked on a number of creative independent endeavors, including solo albums, movies, Broadway, television and music production. *NSYNC’s musical legacy includes greatest hits where each song represents a milestone along the magical journey for a young vocal ensemble that set a new standard for pop quality, tenacity and celebrity. On the philanthropic front the members of *NSYNC created their own 501c3 foundation Challenge For The Children which raised over $5,000,000 and offered financial support to various children’s charities throughout the United States. Bio written by Chuck Taylor. For more than 97 years, the Hollywood Chamber of Commerce has provided leadership, business development resources, networking, and government affairs programs and services to keep the Hollywood business and residential communities safe, relevant and economically vital. Jeff Zarrinnam, is the Chair of the Hollywood Chamber of Commerce Board of Directors 2017-18, and Leron Gubler is the President/CEO of the Hollywood Chamber of Commerce. For more information please visit www.hollywoodchamber.net.